Yes. Several nutritional supplements potentially are beneficial in minimizing side effects of cancer treatments and helping in the effectiveness of cancer treatments. If you are a cancer patient, before adding any vitamins or minerals to your daily regimen, it is important to first coordinate with your integrative healthcare physician and your oncologists. At certain times during cancer treatments, some vitamins or minerals may not be appropriate, or else dosages of vitamins or minerals may need to be changed to maximize their benefit. The role of vitamins and minerals during cancer treatment is a very controversial topic in medical circles. As many recent headlines attest, there is heated debate as to both the efficacy and safety of adding vitamins and minerals to cancer treatments. Because of this, it is even more important that you gather as much information as possible when investigating supplements, and allow your integrative healthcare physician and your oncologists to guide you. � Antioxidants�Vitamins C, E and A play a vital role in bolstering immunity. Vitamin C is one of the most powerful antioxidants. Women undergoing chemotherapy or radiation treatments can consider taking at least 1,000 mg of vitamin C daily to help prevent or reduce the side effects of treatment. If you are a breast cancer patient undergoing treatment, be sure to first consult with your integrative healthcare physician and your oncologists. Vitamin E is another powerful antioxidant that is found naturally in vegetable oils, nuts, and seeds. Vitamin E reduces carcinogen production and strengthens immune cells and cell membranes against the penetration of viruses and toxic chemicals. Vitamin E functions best with adequate levels of selenium as selenomethionine, and vice versa, as both of these compounds are antioxidants and cell membrane protectors. A dose of 400 units of Vitamin E once a day is customary. If you are a breast cancer patient undergoing treatment, be sure to first consult with your integrative medical physician and your oncologists. Vitamin A and its derivatives, retinoids, are being investigated for their potential to treat breast cancer. Some preliminary studies indicate that Vitamin A and some other retinoids have the potential to modify cancer cells. A dose of 25,000 units of Vitamin A per day is the standard recommendation. If you are a breast cancer patient undergoing treatment, be sure to first consult with your integrative healthcare physician and your oncologists. � B-Complex vitamins: The main components of the B vitamins are: B1 (thiamin), B2 (riboflavin), B3 (nicotinic acid and nicotinamide), B5(pantothenic acid), B6 (pyridoxine), B12 (cyanocobalamin), folic acid, biotin, choline and inositol. Several studies suggest that the B vitamins may work together to help minimize the side effects of cancer treatments. If you are a breast cancer patient undergoing treatment, be sure to first consult with your integrative healthcare physician and your oncologists. Folate, a member of the �B� vitamin family, has been shown to help reduce the possibility of genetic mutations caused by toxins and free radicals that may lead to breast cancer. A good B-complex vitamin supplement is the best way to incorporate all the benefits of the B-vitamin family. If you are a breast cancer patient undergoing treatment, be sure to first consult with your integrative healthcare physician and your oncologists. � Coenzyme Q10 (CoQ10), also known as ubiquinone or ubiquinol, is a naturally occurring nutrient normally present in our bodies and available through foods (especially fish or meats) and supplements. In addition to being an antioxidant, CoQ10 plays a significant role in the energy system of each of our cells. A study conducted in Denmark in 1994 showed that patients with breast cancer who were given CoQ10 fared better than those not taking it. In order to better understand the role of CoQ10 in breast cancer, a recent clinical trial including 200 women hospitalized for the biopsy of a breast tumor was conducted. Concentrations of CoQ10 in blood and concentrations of vitamin E in plasma were determined. A deficiency in CoQ10 was noted in both breast cancers and non-malignant (i.e., non-cancerous) breast tumors. Vitamin E concentrations, however, were within the normal range, regardless of the type of tumor. A correlation was shown between the intensity of the vitamin deficiency and the bad prognosis (i.e., bad expected outcome) of the breast disease. In other words, the more serious the type of tumor, the less CoQ10 was present in the blood. The researchers speculate that, because pro-oxidants may promote tumor formation, CoQ10 supplementation might be beneficial to breast cancer patients. A dosage of 100mg of coenzyme Q10 per day is the standard recommendation. If you are a breast cancer patient undergoing treatment, be sure to first consult with your integrative healthcare physician and your oncologists. � Calcium D-glucarate is the calcium salt of D-glucaric acid, a natural substance found in many fruits and vegetables. Calcium D-glucarate has been shown to inhibit the action of beta-glucuronidase, a bacterial enzyme that otherwise prevents the elimination of certain toxins from the body. One of the main ways the body gets rid of toxic chemicals, as well as hormones such as estrogen, is by attaching glucuronic acid to the toxic chemicals in the liver and then excreting this complex in the bile. Beta-glucuronidase prevents this from happening and consequently the toxic substance is available for re-absorption by the body. Elevated levels of beta-glucuronidase have been linked with hormone-dependent cancer like breast cancer. If you are a breast cancer patient undergoing treatment, be sure to first consult with your integrative healthcare physician and your oncologists. � Selenium is a trace mineral found in certain kinds of nuts and meat of liver. Although selenium appears to have protective effects against development of various types of cancer, research shows that selenium may be of particular benefit for those women who are genetically predisposed to developing breast cancer. A dose of 100mcg of selenium per day is the standard recommendation. If you are a breast cancer patient undergoing treatment, be sure to first consult with your integrative healthcare physician and your oncologists. � Bromelain is an enzyme found in pineapples. Research shows that bromelain may support anti-tumor responses in cancer patients. Bromelain reduces blood levels of kinins, which are proteins involved in angiogenesis, the process that supplies new blood vessels to tumors. Research also indicates that bromelain breaks down fibrin, a component of the gel-like substance that encases solid tumors. 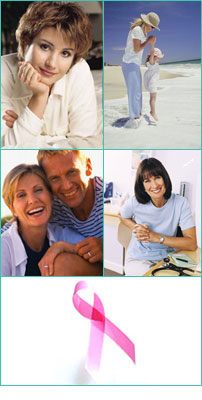 By breaking down fibrin, bromelain helps cancer cells become more vulnerable to the body�s immune responses. Other research suggests that bromelain increases the quantity of cytokines, immune system growth factors that are produced by white blood cells. In addition to eating pineapples, you can obtain bromelain in capsule and ointment form. If you are a breast cancer patient undergoing treatment, be sure to first consult with your integrative healthcare physician and your oncologists. � Melatonin. The hormone melatonin helps protect breast cells against free radical damage, chemical carcinogens, and cortisol-induced damage. Melatonin also blocks estrogen receptors on breast cells, stopping them from proliferating in response to estrogen and other factors that promote tumor growth. Our bodies produce melatonin during the darkest hours of the night. Exposure to light at night interferes with melatonin production and is believed to increase a woman�s risk of breast cancer. It is best to start with a very small dose (0.1 mg) of melatonin and take it at night. If you are a breast cancer patient undergoing treatment, be sure to first consult with your integrative healthcare physician and your oncologists. � Zinc is an important mineral. Zinc deficiency may be a contributory factor to cancer development. Not only does zinc bolster immunity, but also zinc aids the formation and function of many enzymes that help detoxify the body. Although zinc can promote tumors under certain circumstances, several studies indicate that zinc may play an important role during various types of therapy (including post-surgical adjuvant treatment involving chemotherapy or radiation therapy) of cancer. Zinc should be taken at a separate time from that of other supplements and at a separate time from eating food. A dosage of 15-30 mg elemental zinc is considered safe for cancer patients. However, if you are a breast cancer patient undergoing treatment, be sure to first consult with your integrative healthcare physician and your oncologists.